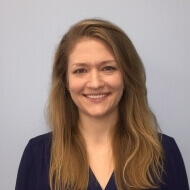 Jessica is the clinic manager of the Waltham office and a two time graduate of Boston University with a Bachelor’s in Athletic Training and a Doctorate Degree in Physical Therapy. Jessica has vast experience in Division I and III collegiate sports medicine through her athletic training background and enjoys working with active individuals. She has also completed a yearlong post-graduate certificate program through the Institute of Orthopaedic Manual Therapy in an effort to improve her orthopedic skill set and enhance patient care. Jess places a great emphasis on patient education and injury prevention in her treatment approach and believes in the patient being an active participant in setting treatment goals in order to achieve success with physical therapy treatment. Jess has a strong background in rehabilitation with functional and sports specific training in order to help her patients met their most optimal outcomes. Jess also continues to work per diem as a certified and licensed athletic trainer in the Greater Boston Area. Jess is avid outdoorsmen, enjoying hiking and camping and loves to travel and discover new places.